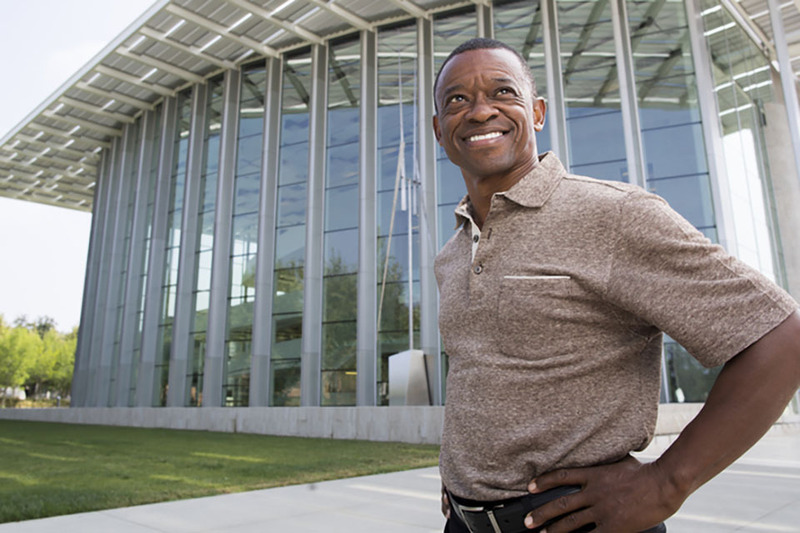 CSUN alumnus Clayton Cameron poses in front of the Valley Performing Arts Center. As a drummer, Cameron has played behind such artists as Sammy Davis Jr., Frank Sinatra and Mariah Carey. Photo by Lee Choo and David Hawkins. Clayton Cameron’s entire childhood revolved around music. He began drumming on oatmeal boxes at age 6, he habitually listened to his dad’s Miles Davis jazz records, and he was hooked on music-related TV shows such as American Bandstand, The Lawrence Welk Show and Soul Train. Once he got his first drum set at 12, he was hooked. A burning desire to perfect his drumming — mixed with a little bit of luck — allowed Cameron ’82 (Music) to begin playing alongside some of jazz music’s biggest names as a teenager. According to Cameron, who in high school was already playing several professional gigs around Los Angeles behind such jazz vocalists as O.C. Smith and Lorez Alexandria, college wasn’t something that immediately came to mind. However, that changed when he attended a percussion and drumming convention at California State University, Northridge. Already a seasoned musician by the time he came to college in 1978, CSUN allowed Cameron to expand his horizons past the technical skills of drumming. Though he continued to play gigs every week while at CSUN, Cameron never let his career get in the way of his college degree. Equipped with a complete percussion arsenal after earning his degree, Cameron’s career quickly skyrocketed. He moved to Las Vegas two months after graduation and began playing with the Kirk Stuart Trio in three shows a day, six days a week at the Desert Inn Hotel. A music enthusiast to his core, Cameron regularly watched other live performances around Las Vegas when he had some free time — a decision that changed the course of his career. Cameron earned an audition and soon after was frequently playing alongside the music legend — a gig that lasted until Davis Jr. passed away eight years later. “Working with Sammy was very memorable because I wouldn’t have been able to do some of the things I’ve done without that gig,” Cameron said. Cameron, dubbed the “Brush Master” for his talent in drumming with brushes, has played with world-renowned performers such as Frank Sinatra, Tony Bennett, Ricky Martin and Mariah Carey. In 2004, Cameron published his first book, Brushworks, and debuted his first CD, Here’s to the Messengers, in 2012. Today, his love for music remains steadfast. When he’s not playing shows or teaching personal lessons, Cameron shares his wealth of knowledge as a music professor at UCLA.